my sister is obsessed with fall, maybe even more then me.. ok probably not. while her birthday is technically in mid-august, we weren't able to actually celebrate it with the whole family until september. this then turned into a combined birthday bash celebrating my mom's late august birthday as well. i figured a maple based cake was the perfect flavour combination to go with an early fall celebration! the party was a lot of fun. we ate these ribs & went super italian by holding a boccee tournament. it was like the grown up italian version of a beer pong tournament. anyways, enjoy this dreamy looking cake! it is filled with pure maple syrup & cinnamon, some of my favourite ingredients (i'll get to you in october pumpkin;)). 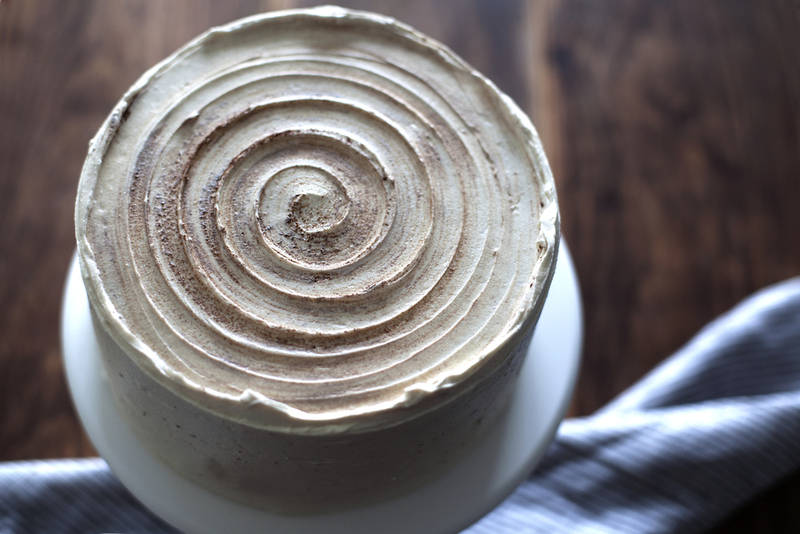 this weekend's gloomy, rainy weather may be the perfect excuse to stay in, get cozy & make yourself this cake! preheat oven to 325 degrees. grease & flour two 9-inch round cake pans. in a mixing bowl sift flour, baking powder, baking soda, salt and cinnamon. set aside. in the bowl of a stand mixer with the paddle attachment cream butter and sugar. add oil, eggs, maple syrup and vanilla until light and fluffy. alternate between adding dry ingredients & milk until a smooth batter is formed. do not over mix. evenly distribute batter between the two greased cake pans & bake until a tooth pick comes out clean. about 25-30 minutes. let cool completely before flipping & frosting. to make the frosting beat butter, sugar, cinnamon, vanilla and salt until light & fluffy. about 8 minutes.